The Solwind (Solar Wind, P78-1) mission was designed to obtain scientific data from earth and sun-oriented experiments. The Ball Aerospace built spacecraft was sun-oriented and had its spin axis perpendicular to both the orbital plane and the satellite-sun line. It was based on the OSO 7 satellite and consisted of a solar-oriented sail and a rotating wheel section. The X-ray monitor, designated NRL-608 or XMON, was a collaboration between the Naval Research Laboratory and Los Alamos National Laboratory. The white light coronagraph and the ultraviolet imager, were combined in a single package, designated NRL-401 or SOLWIND, and was built by the Naval Research Laboratory. The coronagraph was the flight spare of the white light coronagraph on the OSO 7 satellite. The ultraviolet imager used a CCD imager, one of the first instances of a CCD in space. 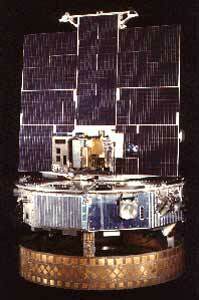 In 1985 the satellite suffered degradation of its batteries, leading to repeated temporary shut downs. Additionally, the last of three data recorders had failed. This lead to largely reduced operations with only two instruments producing valuable data. Therefore the satellite was selected as a target for a test of the ASAT (ASM-135) anti satellite missile, although it was still producing important coronal research. Solwind was destroyed on 13 September 1985, when an ASAT missile air-launched by a F-15 fighter hit the satellite.